Hey, guys! Quick question: How do you stay organized? If you're like me, you're probably trying to juggle a thousand industry-related things right now—writing, marketing, blogging, designing, corresponding, etc. It's hard to keep track. That's why I'm sharing my planner essentials! Oh, come on. It's fun. 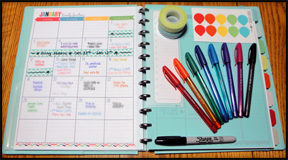 There might be other ways to keep everything straight—including tons of apps to take the place of a physical planner—but this is super obsessive colorful! ► This discbound planner - The pages pop in and out, you don't have to open anything binder-style, and the whole thing lies flat. It's heavenly. Plus, I got a huge discount on Black Friday! ► Filler sheets - You can buy special agendas/calendar pages, or you can download fun printables. I found mine on Etsy, but this blogger offers a free 2014 template! ► Accessories - Dividers, pens in various colors, repositionable stickers, and Washi tape. That way, I can color-code expenses, blog posts, writing deadlines, etc. I know. My method seems a little intense at first glance, but it's the only way I can keep up. If something happens to this planner, I might start posting about weird things at odd times during the week. I'll send contracts late. My books won't get written. THE WORLD WILL SURELY FALL INTO CHAOS. *Cough* Okay, so I just like all the color it adds to my desk. P.S. Don't forget to plan downtime. I finally took a night off, a couple of weeks ago, and it was a-maz-ing. My sister and brother-in-law surprised me with great seats to one of my all-time favorite things—hockey! I bought an exercise book to note my guest posts and important blog events. Nothing fancy but it helps keep me on track. Wow Carrie your method is amazing and I really need to buy a new stack of pens. Um... I have a diary lol! That's about as far as my organisation goes LOL! Not surprised you're so organized. I'm just staying on top of my blog for now so I have an interview schedule for the year to be sure I'm on top of things. I use a combination of computer tickles of important dates and my calendar, and a small notebook to keep track of court hearings and important dates at work. Not sure how I'd organize all the publication deadlines yet. What's MY method for staying organized? Well, I'll tell you...uh, hm, it's over here somewhere, under this pile, maybe. Er, probably in that drawer. Um, let me get back to you on that. I don't do anything by hand that I can do on my computer. That's how I try and keep track of things. Though I do have a huge whiteboard. I need to start using that again. Hockey! Now that is awesome. I print out a blank calendar to keep track of book and blog stuff and keep it in an old folder. Yours looks much nicer. I use a desk calendar to keep track of things (I used to have a diary, but I prefer to have the whole month set out in front of me so I can keep track of dates!). I also use a lot of post-it notes! I keep a notebook that I scribble things in and a daily planner I tell myself to keep with me and then forget to carry. It's no wonder you make me look like a child trying to pretend to be a grown up! My planner? I accidentally forgot it back in Canada. Okay, that's a lie, but I'm distracted. I promise I'll get back to it next month. I have seen one like yours somewhere. Maybe on tv. Only you could make organization look so pretty! I am far from organized. Occasionally I'll jot notes in my iPhone, and my computer can sometimes be covered in sticky notes all down the sides, but that's about as much as I can manage! Hey, with a last name like List, you better be organized. :P Seriously, though. That's awesome. I do all of my financial stuff in Excel. Thanks, Jennifer! <3 I think you're the exception to the rule, here. You don't need organization to dominate everything you endeavor to accomplish!